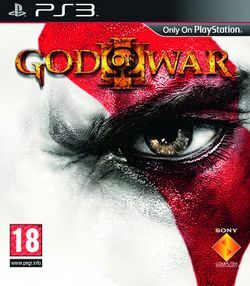 God of War III is the latest installment in the God of War series, exclusively released for the PlayStation 3 on March 16, 2010 in North America, March 19 in Europe and March 25 in Japan. It is the fifth chapter in the series chronologically, after God of War: Chains of Olympus, God of War, God of War: Betrayal, and God of War II. As in previous games, God of War III features large, intricate landscapes, showcased by the game's fixed-camera view that pans along with Kratos and the action, as well as multiple weapons and magical attacks. New to the series is the addition of an item system, giving Kratos another tool to defeat enemies and solve puzzles. God of War III picks up immediately where God of War II ended, with Kratos riding on Gaia as she climbs Mount Olympus. The Titans are mounting an offensive against the Gods of Olympus. The player control Kratos as he continues his quest for vengeance against Zeus and the tyranny of Olympus. Kratos will fight God and Titan alike, giving no quarter as he struggles to acquire the ultimate power to defeat the Gods held within Pandora's Box. Special editions of the game were released with extra content, sometimes in conjunction with pre-orders. In October 2009, SCE Studios Santa Monica announced the God of War III Ultimate Edition. With a pre-order, the package included a high-end sculpted replica of Pandora's Box, a limited edition God of War art book, and exclusive digital content available via the PlayStation Network. The exclusive digital content included the "Challenge of Exile" mode, "Dominus" premium Kratos skin, God of War: Unearthing the Legend franchise documentary, the God of War trilogy soundtrack, and the God of War: Blood & Metal EP, which is a heavy metal homage featuring original music from bands on the Roadrunner Records label such as Opeth, Killswitch Engage, Dream Theater, Trivium, and Mutiny Within with songs inspired by God of War. 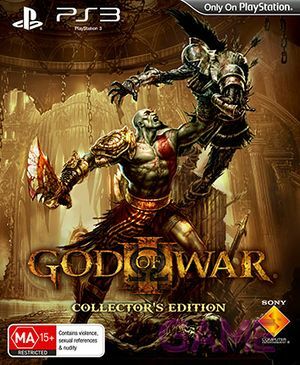 The Collector's Edition, only available in Europe and Australia, contains the game along with God of War III themed postcards and downloadable content redeemable through the PlayStation Network. The DLC includes two skins for Kratos and seven unique challenges for the Combat Arena. An updated version of the game was released on the PlayStation 4 in July 2015, titled God of War III Remastered. Two compilations were also released at the same time as the standalone game. God of War Trilogy was released in Japan, and includes the God of War III game as well as God of War I and II as the God of War Collection. 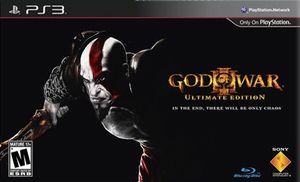 In Europe, Australia and New Zealand, God of War III Ultimate Trilogy Edition was released, which includes everything from the Ultimate and Collector's editions as well as the God of War Collection with the first two games on it. This page was last edited on 6 September 2015, at 04:11.